For such a low-cost 4G device, the Nokia Lumia 635 performs admirably, especially when you consider the free upgrade to Windows 10. Unfortunately, the battery life does let the team down a little, but if you’re used to charging your phone a couple of times a day, then you probably won’t notice this niggle. So it’s a very basic phone that meets almost all the requirements of a modern smartphone user (reminder: NO front-facing camera). But the 625′s 4G capabilities and its low price make it something more than just another satisfactory phone. They make it a good buy. Overall, the Lumia 635 is an odd mix of hardware cutbacks for affordability with some premium software features thrown in. It's rather strange that the Lumia 635, which has a single camera and only a moderately good display and processor, is the first to offer Windows Phone 8.1 and the perks that come with it, such as Office software, Here Drive+ navigation and a Cortana digital assistant that is sophisticated enough to create reminders by tracking information inside of emails. Maybe the phone doesn't know if it wants to be a kid or a grown-up. But there are a few major caveats. That lack of a front-facing camera will be a deal breaker for many. To get a decent front-facing camera and LTE in a current phone on T-Mobile, you need to make a big price jump up to the excellent Moto G for $219. You'll lose the expandable memory, but you'll gain the more mainstream world of Android apps. 60% Lumia 635 review: Could this be the low-priced future of Windows Phone? I wonder, though, how many Lumia 635s will be returned when consumers discover the lack of a front-facing camera. That’s a real blow to the platform, especially when you factor in the lack of first-party apps in the Windows Store. Phones like the Lumia 1020, Lumia Icon, and Lumia 1520 have given Lumia owners something to brag about. Phones like the Lumia 635 will straddle the narrow line between value and mediocrity. 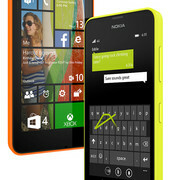 Nokia - or Microsoft, as the future would have it - has another winner on their hands on the low end. If the same distribution is used as the Nokia Lumia 520 and Nokia Lumia 521, I see no reason why the Nokia Lumia 635 shouldn’t have similar success. 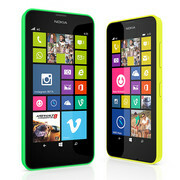 The Nokia Lumia 635 is nigh-on identical to the Nokia Lumia 630, only with the addition of 4G connectivity. But the resultant bump up in price carries things in the wrong direction. All of a sudden, comparisons to similarly priced Android phones become less flattering, and a case for buying the Lumia 635 becomes tougher to make. The Lumia 635 remains a decent all-round phone, though, with a level of build quality that outshines anything else at this price point and a fresh new Windows Phone 8.1 OS. The Nokia Lumia 635 is a great value 4G Windows phone, but its shorter battery life than its 3G counterpart may be a bit of a deal-breaker for those hoping to get all the benefits of the Lumia 630 with faster data speeds. 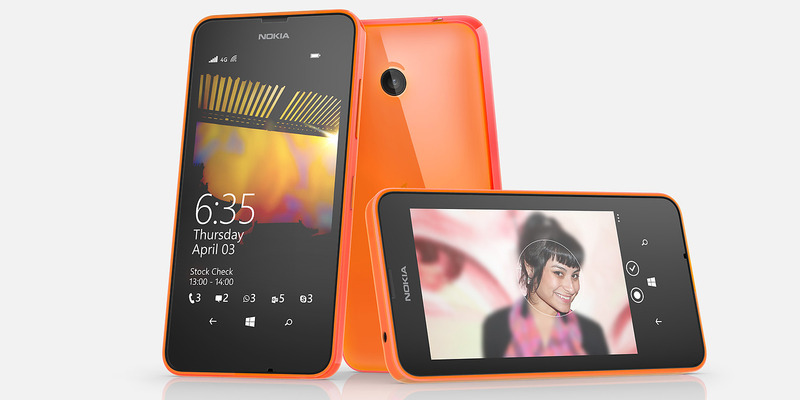 We're big fans of both phones, but if 4G isn't a priority, we'd stick with the Lumia 630. The Nokia Lumia 635 is a slight update to an already well-rounded budget blower that brings 4G powers to the table and a slicker, glossy body too. Even though Windows 8.1 packs in many features we've been craving for ages, it's still playing catch-up with the big boys of the phone world. But if you're after a basic, no-nonsense phone that ditches the bells and whistles for a speedy 4G connection, iPhone 5c-style styling and a solid OS, the Lumia 635 could be the budget handset you've been waiting for - and you can bet it'll get even cheaper with network branding too. 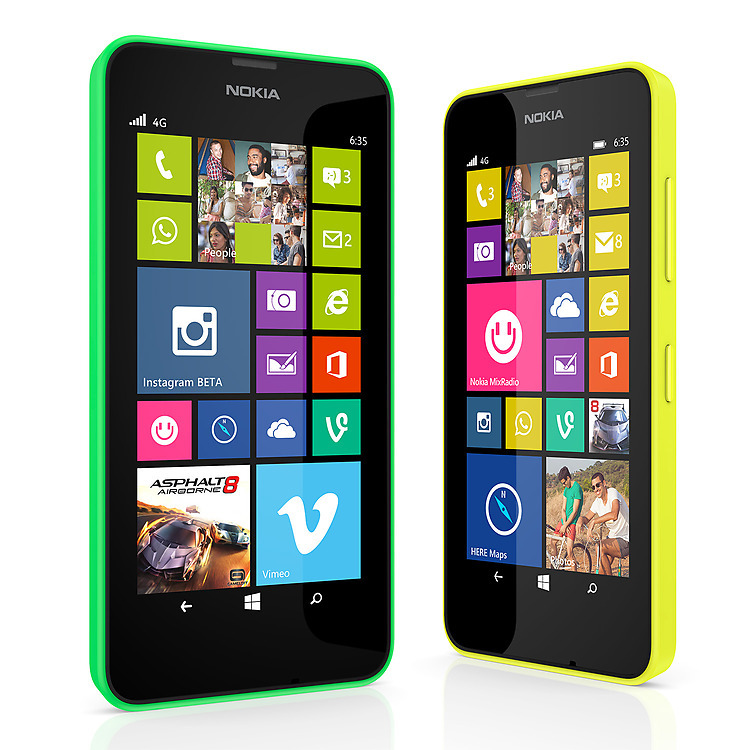 The Nokia Lumia 635 is the slightly bigger brother of the 630. 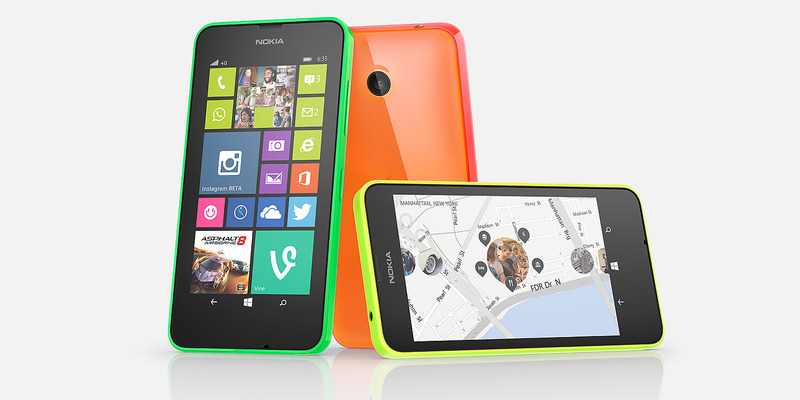 The biggest difference is the inclusion of 4G LTE compatibility in the Lumia 635. So, it's a budget phone aiming at those that want to experience 4G LTE without paying a premium. The 635 is powered by a quad-core Qualcomm Snapdragon 400 with a clock rate of 1.2 GHz, which is pretty decent for a budget device of its price. The drawback is it only comes with 512 MB of RAM, which hinders its performance. Expect some lag during multitasking and more resource-hungry applications. The Lumia 635 sports a 4.5-inch IPS screen with 480 x 854 resolution and includes Clearblack technology. The resolution is actually a little low. So, there will be a lack of sharpness. However, with IPS and Clearblack, expect good viewing angles and better than average outdoor legibility. The 5 MP rear camera doesn't come with flash. So shooting at night is out of the question. The camera is good enough for taking simple shots. The Lumia 635 doesn't feature a front camera, which is a let-down. The device is powered by a 1830 mAh battery. This is more than enough to make it through the entire day with the low specs. However, having 4G on will drain it faster. If you’re looking for a budget Windows 8 phone with 4G capability, the Lumia 635 is your best bet. 73.73%: This rating is bad. Most notebooks are better rated. This is not a recommendation for purchase.